Good news pool miners, seven blocks mined today up till now. Lucky! Lets see some more today! Payments are confirmed and on their way! Tnx! Today is a very good day! Payments are set to payout every hour so we have qjick payments. No more waiting to be paid out. Payment limit is set to only 0.2ETH so point your rigs at ethermine.rocks and come mine with us! Happy mining! Hovering at above 5 GH now! welcome to the new guy at pool! Yea he only stayed like 3 hrs. looks like a lucky day for this pool. total of 10 blocks mined up till now today. Keep the hash going guys Invite some more peeps to come on over. How can I make a more detalied statistics of how can I earn. I have a Hashrate of ~40MHs. What will be my earning per da/week/month ? 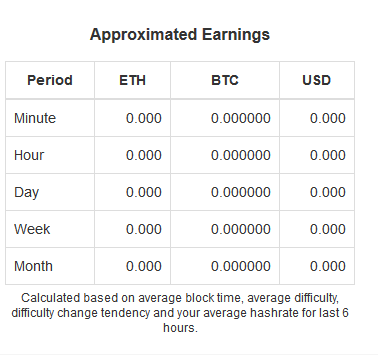 At nanopool there is a table http://i.imgur.com/eIdu5W0.png with Approximated Earnings. I want to compare if this pool is better for me or not. @sirandrei you can't use a pool's info to estimate your earnings acurately. Only thing you can do is try them over a long period. Ive been mining on this pool for around 14 hours at 33MH, but all my balances are still at 0. Can someone explain why this is so. I'm very new to Mining any Crypto Currency, currently i'm on ethpool, but I am interested in this pool. Is it standard to have to "catch up" to the current block before getting any payouts? I'm currently at 3.5t on ethpool and it says 1 month till next block. Thanks for any information. Guys thank you for your replies. @Crystal_Eth ethpool has a bias of its own. Its payout model does not favour small hashing power. You would be correct to chose another pool to mine at. This is a prop scheme pool. Payouts are after each block is found. Though we have only a couple blocks mined in the last two days prior stats show up to 12 blocks each day. Prop payout would mean you wozld get a peace of every block mined at pool proportional to your percentage contributed to current round. So you would get a more frequent payouts yes. Sounds Good, I like the Graphs and such at ethpool's website, however I'm more interested in actually feeling like I'm contributing. It would be nice if I didn't have to wait to catch up to the 50.0t before I even would know if I'm going to get any rewards. Smaller Groups, whether its a party, job, or anything always seem to work out better for me. We have decided to raise the pool fee to 0.5%, this was delayed as much as possible but after consulting other pool members on their opinion we have decided to go with the 0.5% fee. I know some of you guys wont respond positive to this decision but it has been made to allow us to operate pool payouts (mind you 0.2eth threshold and every hour payouts generate a lot of transactions to cover from pool wallet) and other transactions (such as operational costs or running a pool) without issues and for the benefit of all miners. This call comes during not a good period of for the pool as seems yesteday's period of lower pool luck has prolonged till today so we usually mined between 6 and 12 or 13 blocks which is great average for a smaller pool so mining here has been profitable above average. I have already been asked questions in this regard so I believe this will not last long and we will be back to above average in no time. Mind you I have checked other pools as well and lot of them show low luck in this period. So this is not unusual at all. Also we are working hard on some server upgrades that will further improve stability and response and speed of pool, also might further increase pool profitability but we are facing a unwanted possibility that we might need to reboot pool server in order to get everything running smoothly. As this might result in disconnection of miners from pool ports we will resort to this as our last possibility. Good news is after all this is sorted out we are working on some nice suprizes that will benefit all miners present on pool. I will not say much more until we are ready. Thank you all for backing up our efforts! Any comment on the proposed soft/hard forks to bail out the DAO @ethermine_rocks ? Any idea why the new block has been pending for 6 hours? @ethhash im quitting mining here till i get an update about the above block and the soft/hard fork. is it possible we are still mining on the old eth fork? @shutfu yes we have an issue with a stuck block not being redistrubuted for some reason tho pool balance is ok and credited, we are working on resolving this, once resolved there will be some nice payouts. now back to fixing that stubborn payment processing module. Just a quick notice payment module all fixed and woking as it should. All paymwnts have been sent! @ethermine_rocks what is your stance as a pool on soft / hard forking?